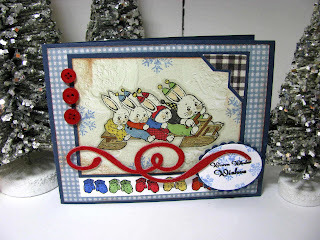 I was finally able to play with the newly released Crafty Secrets "Snow Bunnies" stamp set that I've been itching to play with lately! 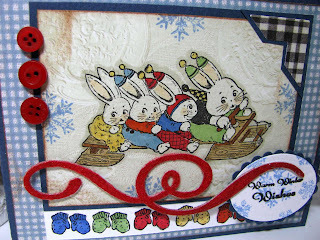 These little guys are so cute, and so different from some of the winter snow stamp sets out there! I decided that the blue gingham paper from Crafty's "Earthy" paper pad would do the trick for the little winter scene, and I stamped a row of mittens below the image because, well, WHERE ARE THESE KID's MITTENS? Either they threw them off or some little bunny Mom is overworked and overwhelmed! My chipboard swirl obsession got a workout again here; this time I colored the chipboard in with my Cadmium red copic marker and then covered it with red fun flock, to make a fuzzy swirl. Dang, I should have fun-flocked the mittens, too! Where was my brain that day? I've been foggy for the last 3 days because I think I have a cold or sinus infection. I need it to GO AWAY! Why is it that you only notice the mistakes when your card is up close and personal on the web?! L.
I love these bunnies and can't wait to get mine to play! I love your flocked swirl!!! Hope you feel better soon!